The Olympian, September 4, 2006. Two tracked excavators rumbled through the diverted, dry streambed of the Mashel River last week and dropped 40-foot trees and refrigerator-size boulders into a massive, muddy hole. Another disaster for a river that’s taken a lot of punches during the past 100 years? Nope. The excavators are doing the heavy work of creating 13 big engineered logjams that will soon provide shelter for young salmon and spawning grounds for adult salmon. Think of the excavators as the instruments of major surgery – and new life – for the Mashel River, said Jeanette Dorner, the Nisqually Tribe’s salmon recovery manager. The Nisqually Tribe and South Puget Sound Salmon Enhancement Group are in charge of the $440,000 project. Three huge logjams and one smaller logjam are transforming the riverbank at Smallwood Park, said Teresa Moon, project manager. A 10-foot-tall rock riprap berm was used to protect the park from erosion, but salmon and steelhead paid the price. The rock berm squeezed the river and speeded up the flow, which left no place for salmon to spawn or young salmon to rest or feed. The new log jams, which will contain dozens of logs and boulders in six layers, will protect the park and create prime fish habitat, Dorner said. No cables will be used to tie the logs together. Giant logs sunk deep into the riverbed – just like pier pilings – will anchor the mass of logs, rootwads and boulders in place. The logjams, which look like giant tangles of Tinker toys, will buffer the park against high flows and collect even more fallen trees. Logjams provide cover, pools and they help the river gouge out shallow gravel bars, which provide spawning grounds and grow insects for young salmon to eat. The Mashel River is a major tributary to the Nisqually River and is one of the two streams that can support Chinook salmon. The Mashel endured years of abuse, including heavy logging close to the banks and the removal of logs from the water. At one time, it was thought that logs in rivers blocked salmon and hurt runs, but that was wrong, Dorner said. Studies show that healthy rivers – and salmon runs – need a lot of fallen trees, Dorner said. Improving the Mashel will help boost runs of Puget Sound Chinook salmon to the Nisqually River. Puget Sound Chinook are now listed as threatened under the federal Endangered Species Act. Smallwood Park is closed while the logjams are built, but the park will reopen. “The park will still be protected, and we’ll have better habitat for fish,” Dorner said. The Mashel is also a safety valve for salmon if a natural catastrophe hits the Nisqually River, Dorner said. Mashel River Chinook could repopulate the Nisqually River over time, Dorner said. Dorner and Moon are sure that the logjams will work because seven other logjams installed two years ago downstream of Smallwood Park now swarm with young Chinook and coho salmon, steelhead and cutthroat trout, Dorner said. “We’ve snorkeled those logjams and seen a 60 percent increase in juvenile fish compared to areas upstream,” Dorner said. Workers installed a temporary diversion dam on a 300-yard section of the Mashel River last week and relocated the fish. The diversion dam will be removed and the water will be allowed to flow back into the streambed in about a month. 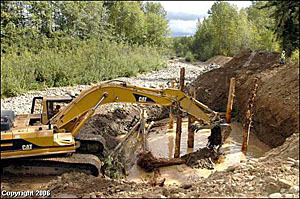 Workers will create all 13 new Mashel River logjams by mid-October, Dorner said. The heavy equipment and muddy holes will disappear, and new brush and trees will soon heal the gouged ground near the river, Moon said. The logjams installed in 2004 now look completely natural — and they’re collecting new logs and creating gravel bars, Moon said. Much of the money—$319,000—for the Mashel River logjams came from the state Salmon Recovery Funding board. Pierce County Parks, the city of Olympia, Fort Lewis, Pack Forest and private donors provided many of the trees for the logjams. For more information on Mashel River projects, go to spsseg.org or www.iac.wa.gov/srfb/board.htm or www.nisqually-nsn.gov/salmonrecovery.html.